It’s our third day on the mountain on July 10 and right now we’ve just finished lunch. I’m calling you from Scott Fisher Camp which is at 12,900 ft above the Shira Plateau, the oldest volcano that comprises Kilimanjaro. 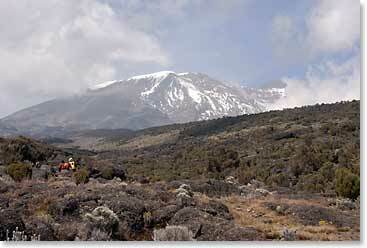 Julius, one of our guides, has a lot of geological experience on Kilimanjaro. He worked at the University of Minnesota for several seasons including once when he spent 35 continuous days living in the crater of Kilimanjaro studying the glaciers as well as the geology. He has been a great teacher to us. We have a team here that is, by my judgment (and I’ve seen a lot of people trying to climb Kilimanjaro), extremely well acclimatized. We have no headaches and a really excited crew. They’ve hiked strongly. Their conversation is very lively as we walk up the trail. We are enjoying the beauty and we are especially enjoying the BAI guides and staff and learning about their country. Almost all of the BAI staff on the mountain comes from the Chagga tribe. These guys were telling us today how proud they are that in Tanzania, even though there are 120 tribes, everyone comes together with Swahili and English and no one has any animosity or bitter feelings against any other tribes. There is a great deal of national pride and unity in this country even though there are many types of people who live here. Our guide told us that about 80% of the Chagga people are Christian and 15-20% are Muslim or other religions. Even though they remember their past with their original language and traditions, they have moved forward into the 21st century and are an important part of Tanzanian society today and in government and business. Being the people of Kilimanjaro, we are especially pleased to have Chagga men telling us about their land as we climb this mountain. Later the Huffines family is going to meet people from many other tribes in Tanzania and learn much more about this fascinating and diverse country. Right now the acclimatization seems to be in our favour. The BAI Chagga team has provided us with excellent support, service and care. It is inspiring to all of us. We are doing well towards the end of the third day on the mountain.